The screenshot above is hosted and provided by hermetic.ch. Please contact them directly for any copyright infringement as we are not responsible for that content. The Chinese Lunar Calendar is a lunisolar calendar, consisting of months corresponding exactly to lunar cycles and years which stay more-or-less in sync with seasonal years. The structure of the calendar depends on the exact times of certain astronomical events, principally dark moons and winter solstices. The solar calendar consists of a series of seasonal years which are divided into 24 "solar terms". The lunar calendar consists of a series of years which are divided into 12 or 13 lunar months. A solar year always begins at the (northern) winter solstice. A lunar month always begins on the day of a dark moon. 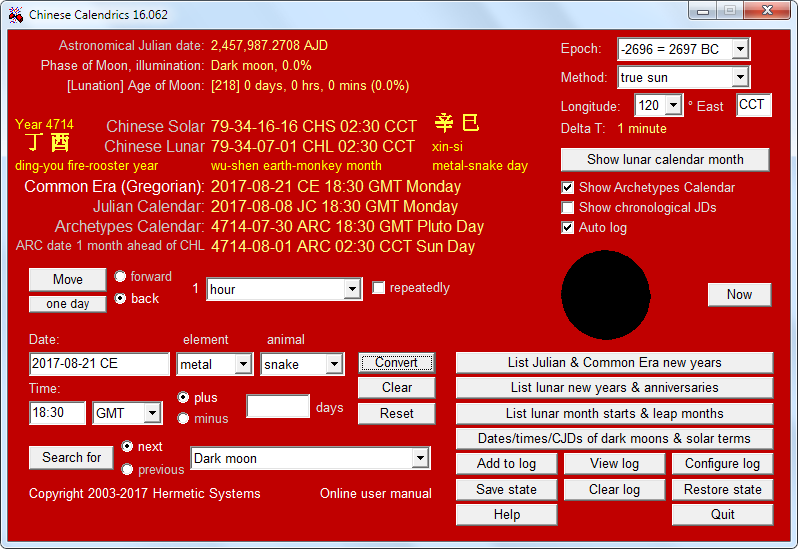 To convert between dates in the Chinese, Vietnamese and Japanese solar and lunar calendars and dates in the Common Era and Julian calendars. To calculate the date of New Year's Day in the Asian lunar calendars. To ascertain the Western dates of the starts of all lunar months in a year in the lunar calendar. To find leap months in the lunar calendar. To find the Western dates corresponding to Chinese, Vietnamese and Japanese anniversaries (e.g., birthdays). To move forward or backward from a given date (and time) either by a period such as a month or by a number of days. To calculate the phase of the Moon for any time within a 6000-year period. To search for the next or previous full moon, dark moon, lunar quarter, solar term or solstice or equinox of a certain type. To search for a solstice or an equinox in combination with a dark moon or a full moon. To search for the next or previous day, month or year with a certain element-animal correspondence (e.g., the next water-ox year or the next fire-dragon day). To find days for which the element-animal is the same for day, month and year. To see an entire month inthe Chinese lunar calendar showing images of the Moon for each day.